Send the top 2 cards of your Deck to the GY, then target 1 card on the field that you can place a Spell Counter on; place up to 2 Spell Counters on it. 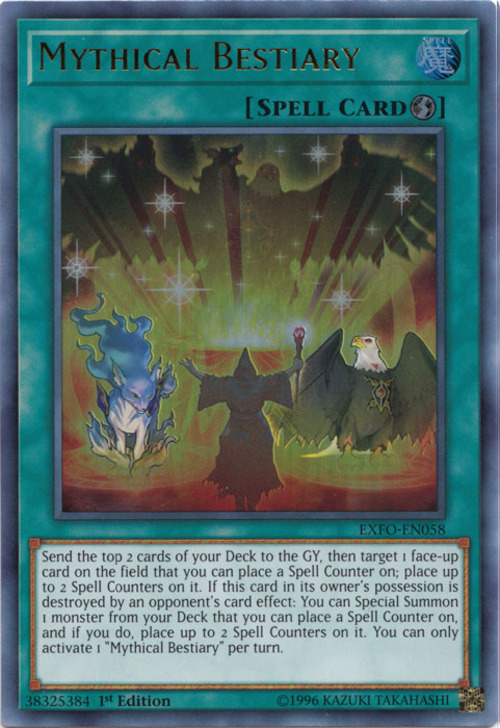 If this card in its owner's possession is destroyed by an opponent's card effect: You can Special Summon 1 monster from your Deck that you can place a Spell Counter on, and if you do, place up to 2 Spell Counters on it. You can only activate 1 "Mythical Bestiary" per turn. 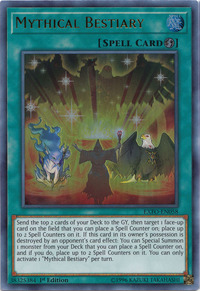 Mythical Beast Jackal and Mythical Beast Garuda appear in the artwork of this card.